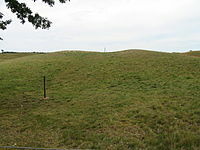 Sutton Hoo is the name of an area spread along the bank of the River Deben at the small Suffolk village of Sutton and opposite the harbour of the small town of Woodbridge, about 7 mi (11 km) from the North Sea, overlooking the tidal estuary a little below the lowest convenient fording place. 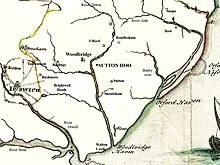 [note 1] It formed a path of entry into East Anglia during the period that followed the end of Roman imperial rule in the 5th century. ^ "Sutton Hoo: Anglo-Saxon ship burial - Google Arts & Culture". Google Cultural Institute. Retrieved 12 August 2017. ^ Akbar, Arifa (25 September 2009). "Golden hoard sheds light on Dark Ages - Home News, UK - The Independent". www.independent.co.uk. Retrieved 3 October 2010. ^ "AD 700 – Sutton Hoo: Current Archaeology". 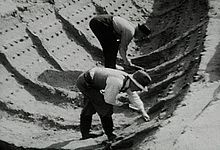 www.archaeology.co.uk. Retrieved 3 October 2010. ^ United States National Museum (1892). Report upon the condition and progress of the U.S. National Museum. G.P.O. p. 606. Retrieved 8 October 2010. ^ Judith Jesch (2002). The Scandinavians from the Vendel period to the tenth century. Boydell Press. p. 47. ISBN 0-85115-867-6. Retrieved 8 October 2010. ^ Robert E. Bjork, John D. Niles (1998). A Beowulf Handbook. U of Nebraska Press. p. 291. ISBN 0-8032-6150-0. Retrieved 8 October 2010. Arrhenius, Birgit (1983). 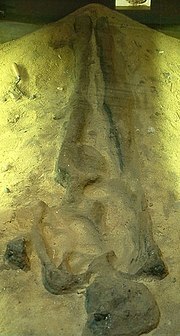 "The chronology of the Vendel graves". In Lamm, Jan Peder & Nordstrom, Hans-Åke (eds.). Vendel Period Studies: transactions of the Boat-Grave Symposium in Stockholm, February 2–3, 1981. Studies – The Museum of National Antiquities, Stockholm. 2. Stockholm: Statens Historiska Museum. pp. 39–70. ISBN 978-91-7192-547-3. Campbell, James (1992). "The Impact of the Sutton Hoo Discovery on the Study of Anglo-Saxon History". In Kendall, Calvin B. & Wells, Peter S. (eds.). 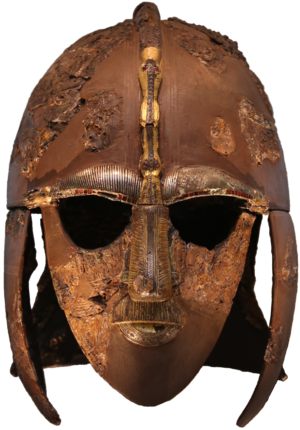 Voyage to the Other World: The Legacy of the Sutton Hoo. Medieval Cultures. 5. Minneapolis: University of Minnesota Press. pp. 79–101. ISBN 0-8166-2023-7. JSTOR 10.5749/j.ctttv0mr.8. Republished as Campbell, James (2000). "The Impact of the Sutton Hoo Discovery on the Study of Anglo-Saxon History". In Campbell, James (ed.). The Anglo-Saxon State. London: Hambledon and London. pp. 55–83. ISBN 1-85285-176-7. Coatsworth, Elizabeth & Pinder, Michael (2002). Hines, John & Catherine, Cubitt (eds.). 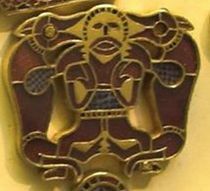 The Art of the Anglo-Saxon Goldsmith: Fine Metalwork in Anglo-Saxon England, its Practice and Practitioners. Anglo-Saxon Studies. 2. Woodbridge: The Boydell Press. ISBN 0-85115-883-8. Plunkett, Steven J. (2001). "Items from the Ship-Burial at Sutton Hoo, Suffolk". In Hultén, Pontus & von Plessen, Marie-Louise (eds.). The true story of the Vandals. Museum Vandalorum Publications. 1. 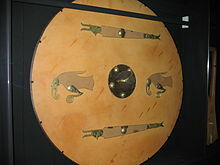 Värnamo: Museum Vandalorum. pp. 65–75. ISSN 1650-5549. Wade, Keith (2001). 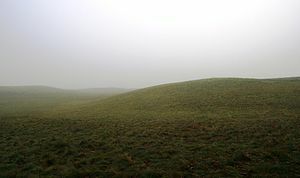 "Gipeswic – East Anglia's first economic capital, 600–1066". In Salmon, Neil & Malster, Robert (eds.). Ipswich from the First to the Third Millennium: Papers from an Ipswich Society Symposium. Ipswich: Ipswich Society. pp. 1–6. ISBN 9780950732817. Williams, Nigel (1992). 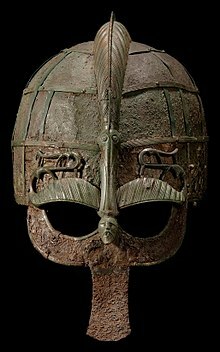 "The Sutton Hoo Helmet". In Oddy, William Andrew (ed.). The Art of the Conservator. London: British Museum Press. pp. 73–88. ISBN 9780714120560.